The West End of Hartford contains multiple Historic Districts, which include just about all the properties in the neighborhood. In addition to recognizing the architectural importance of the collection of homes, and helping protect the properties from inappropriate modifications, the Historic District designation also creates opportunities for owners. One interesting incentive is the Historic Homes Rehabilitation Tax Credit. This past month I had an opportunity to sit down with Lucas Karmazinas, an independent consultant in the field of architectural history, to learn more about the tax credit and how it can benefit homeowners. Owners of single-family through four-family homes in certain areas of Connecticut are able to apply for a tax credit to help maintain or renovate their properties. Examples of projects that may qualify for the credit include most exterior work (foundations, porches, walls, doors, windows, roof, gutters, chimney, etc. ), mechanical systems (HVAC, plumbing, electrical), and interior work (structural systems, floor plans, floors, walls, ceilings, stairs, decorative elements, door/window casings, etc.). Since Hartford is one of the “Targeted Areas,” and so much of the West End is in a Historic District, owners simply have to follow the application process and live in the property as their primary residence for at least five years after project completion in order to qualify. The main benefit to working within the program is that a homeowner can receive up to 30% of the renovation costs back, with a cap at $30,000 per dwelling unit. Since there is also a minimum project size, the practical result is that the program targets renovations with total budgets of between $25,000 and $100,000 for a single-family home. The “tax credit” language is a little misleading. Homeowners technically do receive a tax credit voucher at the end of the project, but it’s not one that they can apply to their personal tax liability. Only certain businesses are allowed to utilize the credits, so homeowners end up selling the vouchers and pocketing the cash independent of their tax filing. Because the credits are not used directly by owners, they don’t receive the absolute maximum benefit. Mary Dunne, who helps oversee the program at the State Historic Preservation Office, conservatively estimated that vouchers generally sell for at least 80% (and often more) of their face value. She also noted that she has never heard of a homeowner who was unable to find a buyer among the 30+ vouchers that are distributed each year. The tax credit is managed through a written application that is broken down into different parts to reflect a project’s various stages. Part One simply confirms that a home qualifies for the program. The only noteworthy reason why an owner-occupied home in one of the West End Historic Districts would not qualify is that the building itself is not historic, that it doesn’t contribute to the historic character of the District. Part Two describes the rehabilitation work in detail, capturing the current condition and articulating the proposed rehabilitation. Photos and drawings are encouraged. During our conversation, Lucas emphasized that in order for the renovation work to count towards the credit it must follow the Secretary of the Interior’s Standards for Rehabilitation. 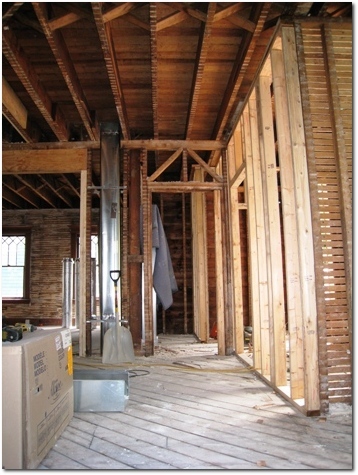 The application instructions summarize the criteria, while the website above provides illustrated guidelines for rehabilitating historic buildings. Part Two also includes the proposed project budget. Cost estimates must be from qualified pros, and qualified rehabilitation expenses are separated from non-eligible costs. Mary said that her group is required to respond to an application within 30 days, though they try to turn them around in about 2 weeks. Ultimately it will depend on the scope and complexity of the project. Part Three of the application is the request for certification of the completed work. In addition to demonstrating that the work was completed as planned, the other major component is the final accounting of the project costs. The tax credit is then calculated as 30% of either the approved budget or the actual expenses, whichever is less. Lucas assured me that it was possible for a homeowner to successfully work through the application process on their own. He said that the staff overseeing the tax credit was quite helpful, though it would take patience, time, and an interest in the subject matter since there are guidelines to learn and follow. Some homeowners may not want to take on both a major renovation and the tax credit application/process. It’s possible that there are general contractors out there who would be willing to handle the application within their overall project management responsibilities. Another option is to hire Lucas, or someone else like him, to help with the application process. Lucas said he is flexible in how he works with individual homeowners. In some cases it makes the most sense for him to charge a flat fee and handle all aspects of the application. In other cases the homeowner may want to do much of the documenting, describing, and photographing, so Lucas could bill hourly for his contributions — consulting as needed and interacting with the State Historic Preservation Office. No matter how a homeowner approaches the credit, it’s a good way to take advantage of living within one of the West End’s Historic Districts. Here are some additional resources to help get started.